Hurricane Irma slammed into Florida on Sunday as a Category 4 storm with 130 mph winds, hitting the Florida Keys first before making a second landfall on the southwest coast of the Peninsula. Coastal flooding from storm surge has been reported on both coastlines, including areas such as the Miami Brickell district. Hurricane Irma has been weakening since its initial landfall on the Florida peninsula around Marco Island, travelling up the west coast to impact Naples and regions further north. At the same time though the huge area covered by the storm meant that storm surge flooding has been reported in areas on the east coast, including in Miami’s central business district, exacerbating insurance and reinsurance losses and making the event more complex. 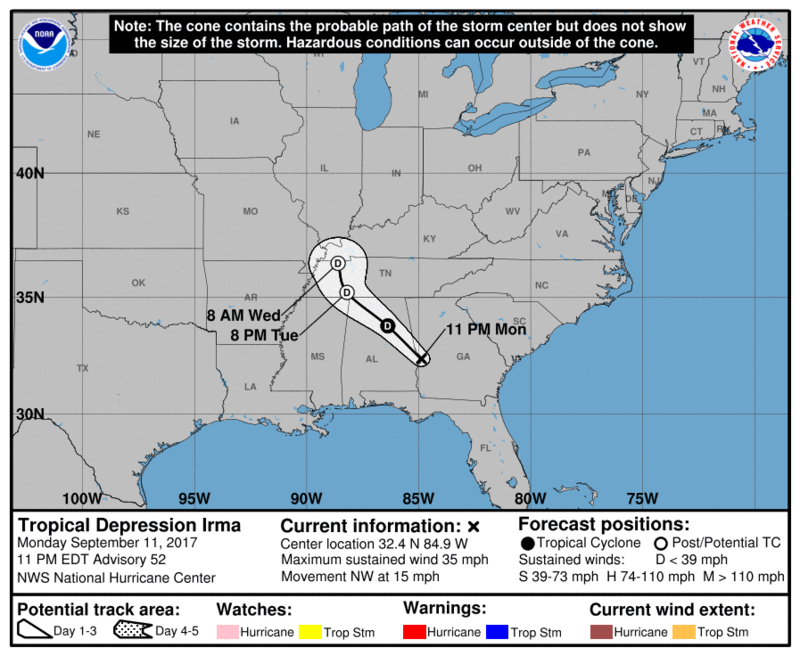 By 06:00 UTC on Monday 11th September Irma has weakened to a Category 1 hurricane with 85 mph winds and was expected to weaken further. But for Naples and also cities like Tampa further north it is expected that strong hurricane force winds and storm surges will cause considerable damage. After the forecast track shifted west the expectations of a market changing reinsurance loss from the event had subsided, but with the flooding occurring down the east coast as well, including in Miami which has perhaps been hit harder than many anticipated after the shift, the complexity of the loss event has risen and the potential industry loss has also. High rise cranes were reported downed in the Miami area, with building damage reported. 2 foot of water was running through the Brickell district of the CBD, one of the highest value insured areas in the city centre and surge flooding seen elsewhere on the east coast of Florida. For Naples and Tampa, along with other cities and towns up the west coast, storm surges of up to 15 foot are expected and there is the potential for significant and dangerous coastal inundation. Additionally damage to buildings from hurricane force winds is expected and more than 3.4 million people have been reported without power in the state already. Tampa may escape the worst that had been expected after Irma made its second landfall which could weaken the storm, but it remains an extremely dangerous and large storm, with the potential to cause loss of life and significant property damage all the way along its track to the north. The insurance, reinsurance and ILS industry will be watching Irma closely to try to begin to understand the magnitude of the impact. But it will be some days and weeks before the full-scale of losses will be understood. For the ILS market it could also be some days until it is known whether any exposed catastrophe bonds have been impaired. But there is almost certainly going to be losses for the ILS sector to pay, whether any cat bonds triggered or not, as some collateralized reinsurance and retrocession, as well as sidecars and private ILS deals, may get hit. Irma seems to be tracking the coast closely, so it could maintain its intensity more than anticipated which will bring a larger surge further north into the Pan Handle areas. No matter how much interaction with land weakens the storm, Irma will bring torrential rains and potentially damaging winds right up the Gulf Coast of Florida and beyond. The fact hurricane Irma is simultaneously damaging both coastlines, including flooding Miami which many may not have expected after Irma’s shift to the west, will make this a much more complex loss for the insurance and reinsurance industry to respond to. Risk modellers RMS said that storm surge could raise the eventual insurance industry loss by as much as 30% in some scenarios, while post loss amplification of a complex storm could hike it another 15%. RMS also said it saw a 10% chance that insured wind losses from Irma exceed $60 billion. At this time the sector will be mobilising its claims and response teams, while analysing the ongoing situation. It is the response to such catastrophic events that allows the re/insurance industry to demonstrate its value. In catastrophe terms Irma is major, with the economic costs likely to be huge across the storms various impacts in the Caribbean and U.S., while the ultimate loss to the insurance, reinsurance and ILS industry will be significant as well. Irma may not be quite the massive industry loss that the industry was predicting as of Friday, but it is still going to rank among the largest hurricane losses in history. The latest surge warnings from the NHC are below along with forecast models and intensity predictions. Extreme levels of rainfall and some tornadoes are also forecast. – Hurricane Irma to stress-test third-party capital staying power: S&P. – AIR puts hurricane Irma as up to $65 billion insured loss. – Live cat trades at $80 billion on hurricane Irma threat. – As Irma tracks west, impact to ILS market lessens: Brookes, RMS. – Increased use of retro to limit reinsurers’ Irma exposure: A.M. Best. – Cat bonds drop 16% on hurricane Irma, prices discounted heavily. – Hurricane Irma track in westward shift, remains on course for Florida. – Stone Ridge reinsurance and ILS fund drops 8%+ on Irma threat. – Interest in back-up reinsurance rises on Irma, live cat still quiet (so far). – Billions of catastrophe bonds at risk from Hurricane Irma. – CCRIF to pay $15.6m on Hurricane Irma impact to Leeward Islands. – Hurricane Irma track aims at Miami, a $131bn realistic disaster scenario. – Blue Capital halts ILS fund buy-backs as hurricane Irma approaches. – Cat bond trading slight on Irma, Kilimanjaro II Re trades down.